Some of Picasso's art was influenced by African masks. Some masks are used for curing sickness. Why are masks important to African traditions and cultures? You might have visited a museum or a store and seen African masks. Have you ever wondered why they were made or what they are used for? Although masking ceremonies are not as common place in Africa as they once were, masks are still looked at as an important part of African culture and history and are still used in important rituals and celebrations. In this website you will learn how to make an African mask using papier mache. In the process you will also learn about how masks were used in Africa and about the many ethnic groups in Africa. 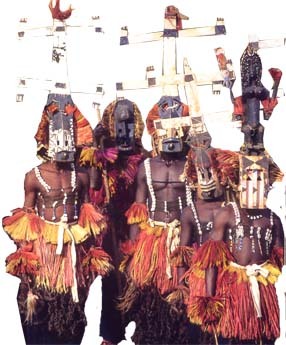 Research the Tribe in which the mask is from. Recreate the Mask using papier mache. Write a Museum Piece that describes your mask and tribe. Multicultural Kits, resources, books, and items for the classroom. Copyright-free images, clip art, handouts, video clips, and free resources for teachers and students.